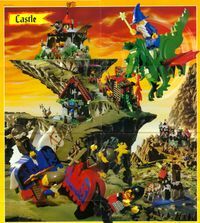 Castle is one of LEGO's core themes and was introduced in 1978. It originally centered around medieval life, involving knights and castles, It also incorporated popular fantasy elements as it saw many changes over the years and the most recent incarnation, Kingdoms, only recently being shelved to make way for the new Castle. The theme is the third longest-lived in LEGO history, on par with Town and Trains. The original Castle logo resembled Part:4495. One of the earliest LEGO castle models produced was a retailer display model from a 1959-60 retailer brochure. This model was also seen in a 1961 British magazine LEGO ad. It was a white castle that fit onto two gray baseplates taking up an area of 20x20 studs. The castle, known to LEGO retailers as #0746 had four towers, with wavy LEGO flags on top of two of the towers. The word LEGO embossed on 1x1 white bricks were spelled out on the front of the castle on either side of the entrance. 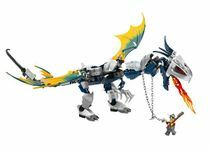 Examples of this model would be glued together, generally the rule among LEGO retailer models. Also coming out in 1960 was LEGO Building Idea Book #1, also known as #238. This 36 page booklet had a lot of building ideas that were made into actual LEGO display models. One picture was of a blue castle with twin towers and a red roof. It is in a northern European late Renaissance style. This Blue Castle was the first castle seen in a public distributed official LEGO product. 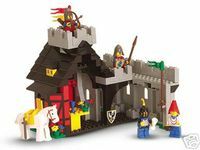 The first LEGO castle model available for sale was 0 Weetabix Castle, a promotional set from Weetabix, that was made available in 1970. 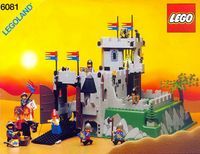 The theme Castle was started in 1978, the year minifigures were introduced. 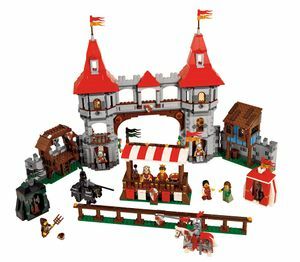 The theme's initial release comprised only one set, 375 Castle. The following year brought two other sets, 383 Knight's Tournament and 677 Knight's Procession. At first those sets were only available in Europe, but they were finally released in the US in 1981. A new faction was added in 1987, the Forestmen, which did not dwell in castles but rather in hideouts built into hollow trees and rocks. This was also the first time when black-coloured corner wall panels were seen. Other black wall panels, which had already appeared in 1985 were brought into wider use when the Black Knights, that featured the first mainly black-colored castle, were introduced in 1988. 1990 brought some new pieces: a new elegant helmet with movable visor and an extra armour piece for knights. Another new addition was the glow-in-the-dark ghost. This year also saw the first castle built on a raised baseplate, a piece first used a year before in Pirates sets. 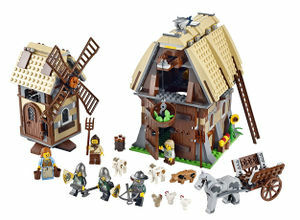 That castle, 6081 King's Mountain Fortress, also featured the first female minifigure with a skirt, which was formed by a 2x2x2 sloped brick. This made the princess one plate taller than the men, but her tall pointed medieval headdress helped to obscure the height difference. 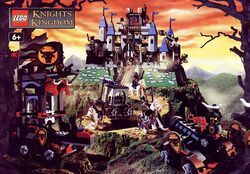 The discontinuation of Fright Knights also marked the end of the basic concept of the Castle theme from 1984 onwards, where the different subthemes also represented several factions that coexisted in a consistent environment and would often appear together in one set. The themes of the following years were self contained subthemes with different factions of their own that did not not have any connection to those of other subthemes. In 2013, a new version of castle returned releasing 5 sets, 4 of which are already out, and one that will be released in August. The LEGO [Ninja' collection relocated the Castle theme to medieval Japan, where the graceful Oriental architecture provided the backdrop for an eternal struggle between two factions of daring and masterful martial artists. The Shogun Gai-Dan and his ally Ito, the gray ninja, defended a trove of mystical rubies from the Bandit Chief Kendo and his band of robbers, as well as Bonsai, the black ninja. The new Castle theme will combine elements from Kingdoms and Castle (2007). It will offer a new story, yet the royal elements are the same as Kingdoms; Lions and Dragons. However, the colors will be blue for the lion knights and red for the dragon knights, somewhat similar to the 2007 Castle theme. This page was last edited on 18 September 2016, at 19:35.